Now watch the curtain open again as dancers come out to take a bow after a performance. Watch the very best open their arms to the audience with the same purity and presence. They know the night is theirs, that they too have won. Do you know that as the curtain is falling, they are awaiting a bounce back open? 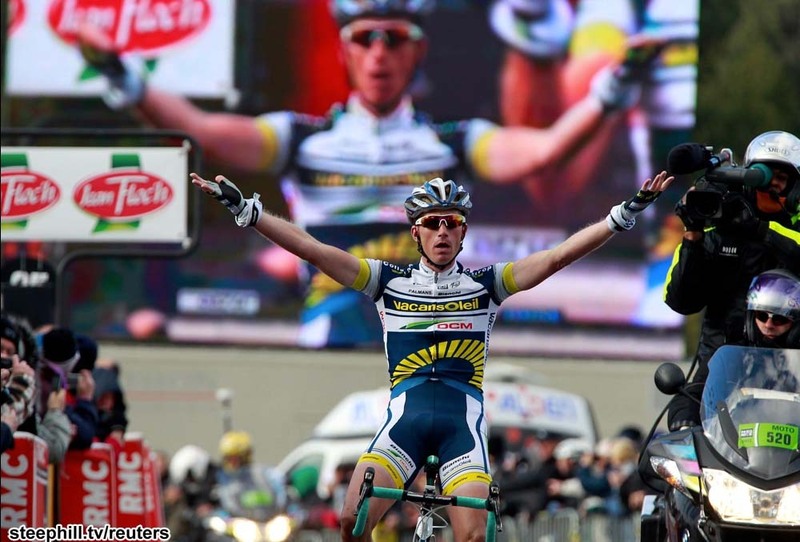 Like Westra, the best are in front, they feel the power of the race behind them, that they have been pushed every day by the people behind them and are better dancers for it, and that together they have all in some sense won the race. So you see, it is not just that the curtain closes or that the cyclist gets his fraction of a second over the line that is marked finish, it is the bounce of the curtain back open, the confident letting go of the handle bars even before the race finish time has been clocked. It is knowing that this is not one race–this win is only one amongst the many behind it and, even better, the many wins ahead. In an X-ray somewhere far away from where I live, not so long ago were the post-crash, smashed collar bones of Swedish cyclist Emma Johansson who was recently hit by a car while training. Johansson is one of the world’s great women cyclists at age 29. Yet there in that X-ray, lines crossed and re-crossed the film. Here is a break, and here another. Here, Emma, is where force decided to take the game. Here is where your bones lost. But Johansson is no loser and her body has a mind of its own in all games mind over matter. These lines were only the curtain coming down where she knew there would be the bounce back up, the opened armed glory that awaits. There was victory herself, just around the corner. Not long after those X-rays, she proclaimed the day a good one (specifically, a podium finish already on March 10, 2012). In fact, just five days after her crash and curtain drop, she climbed on an indoor bicycle trainer and began training again. A sublime crossing this one, a netherworld that is sweeter than winning. 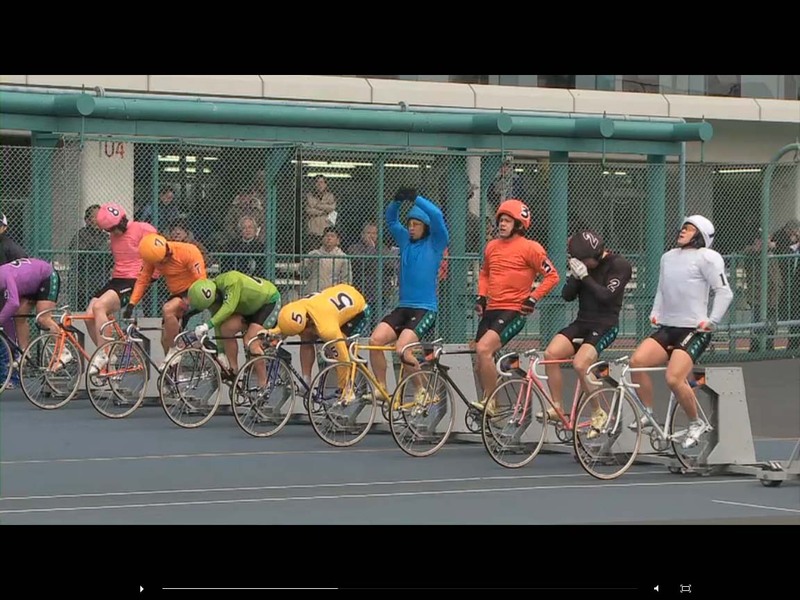 Japanese keirin racers at the gate. There is a backstage view in this video that is the same as a behind the wings look at ballet dancers. Cutting back and forth between bicycle and the body we see the fine-tuning going on, face, leg, stomach, hub, wheel, fork, in the same way we would see a professional dancer’s eyes, shoulders, leg, ribbons, shoes. An up-close and candid view of the beautiful machine shows us a calf glistening with sweat and a shin wrecked with scabs and scars. Evidence of pushing along that line of faster, stronger, better. Surely, in a studio not far away there is the intensity of the professional dancer who is stretching, too. The feet, you would see, are similarly scarred beneath the pretty pink ballerina shoes, like the pink bicycle that appears in the very beginning of the video clip or the pink jersey there. Faster, stronger, better in the ballet studio, as well. Here is a story for you: Tom Simpson died at the age of 27 while racing in the Tour de France in 1967. Read just a tiny bit about him and you know that his story is about the body reaching its limits and him refusing to know them. The body does have limits. This is not news. We all know it. In old film footage, it is possible to see Simpson curving from one side of the road to the next, the crowd lining the street standing nearby, friends and medics rushing in. Finally, we see him fall and get a view of him being carried off by helicopter, out of his own internal chaos which was at full throttle with body giving out and mind going on, going on. The footage can be viewed here: http://www.youtube.com/watch?v=YtAyGvZqiwk. And have you heard of the ballet Giselle? It holds the romantic’s version of this scene: Giselle dies because she can’t keep herself from dancing, or loving, despite a weakened heart. She must dance, in the same way that Simpson was compelled to keep riding his bicycle almost 100 years later. Giselle falls in love, is then betrayed by her lover, making her dance even more. Villagers gather around as her body fails her. Just before her collapse, she wavers dramatically across the stage, no longer dancing but stumbling, believing otherwise–just like Simpson…only with Simpson there is the terror of reality, his falling while famously saying, “go on, go on.” With Giselle, there is a rising from the grave–she succeeds in saving her lover from eternal condemnation by dancing from midnight until dawn for a dark hearted fairy queen. The premise is just short of ridiculous. I say just short because we know that there is the unstoppable in each us. To watch even a few moments of professional cycling is to know that here is the body pushed to its extreme, here is the body in partnership with a very efficient machine that is the bicycle, here is the body looking to match angles, aerodynamics, grams, rigidness and flexibility of frame. The cycling body is never an illusion. It bears weight and power, kilojoules, and every kind of measurement one can imagine these days. It is never rising out of the mist, never looking to appear as if it is not bearing weight. Unlike ballet, races are won by fractions of seconds, there is a clear winner (although splitting seconds is not always so clear), and there is always the threat of crashing. Results are posted, finishes are exact, great rivalries are not hidden, whether gentlemanly or ferocious. The sport at its most extreme levels is unparalleled, its reality literally speeding by us on display. There is indisputably some of the same “go on, go on,” within ballet dancers, but a greater game of illusion. There is the same fire-playing with the limits of the body. But we can’t see very much about what it is to be a dancer, about what the dancer’s body lives, feels, breathes, weighs, thinks—there are no kilojoules and weight is a well kept secret despite its prominence as a topic of conversation, always around it but the precise numbers never really revealed. Here we have the body and not the machine–not the bicycle weight for a won-by-the-split-second time trial. Would it be different if dancers disclosed their weight readily before their seasons at respective theaters the way one can weigh a bicycle? Would the mystery of dancers fine tuning dissolve–a 5’6″ dancer would know definitively where she stood compared to her peers at one weight or another? Less easily unveiled is the impossibility of endless hours of class that are kept behind the scenes. Daily class can’t be as easily boiled down to a number or metric. It is simply difficult and challenging, everyday. We know about this ritual of class, but few ever really get a look at it or can actually comprehend that this is everyday life for a dancer. To do it takes a certain unstoppable-ness, the just short of ridiculous kind.